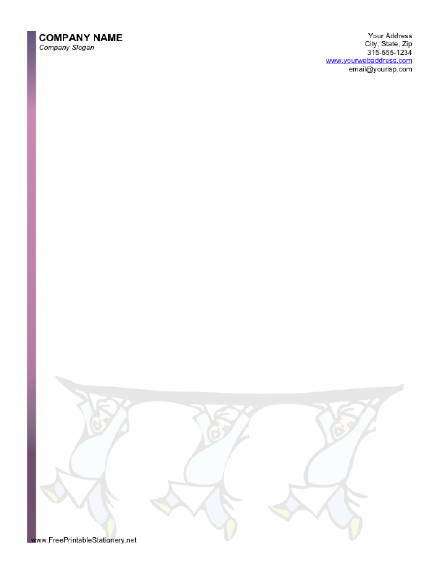 This printable stationery has three chefs or caterers in the background and a purple border on one the left side. Get the matching envelope! A coordinating printable envelope is available for this stationery (#10 legal-size envelope, also in .DOC format). See sample. Business cards and stationery! Free printable business cards that match this stationery design are available at Free Printable Business Cards.net. These stationery designs are in .DOC format: they can be opened and printed with Microsoft Word and many other word processors. You can customize these files by adding your home or business information. Each design is available in unlined and lined versions. Lined versions are meant for hand-written notes. With the Unlined versions, you can type a note directly in Word before printing. If you don't see a stationery design or category that you want, please take a moment to let us know what you are looking for.